Trade Lane related information is at the core of our analytics. 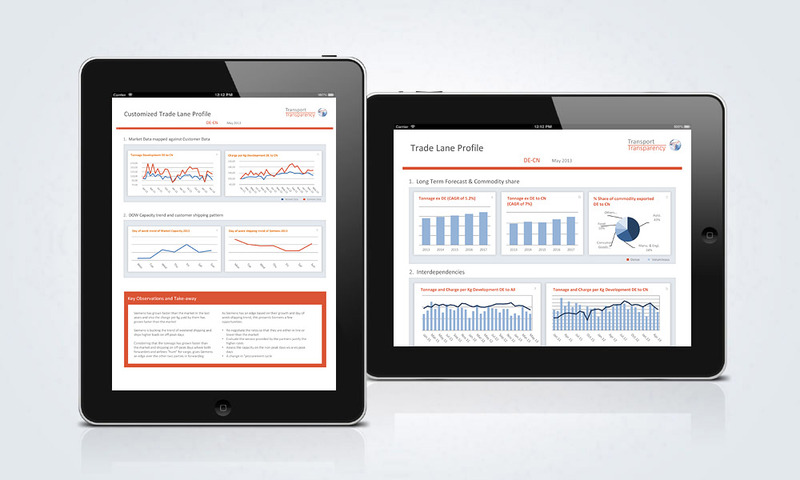 We submit monthly updated Trade Lane Profiles (TLPs) that contain a granular trend update and forecast regarding capacity, demand and rate developments. Subscribers have access to our experts that can support them in drawing conclusions from this excessive transparency. On customers' request we integrate their actual or planned shipment data into the Trade Lane Profile. This allows an easy short term performance assessment and supports consecutive decision making. For each lane you will get an intuitive dashboard with all the information on it, plus a summary highlighting all action needs across all trade lanes. You can translate your modeling outputs into tangible business actions.